Crystals and Gem Stones are used for healing, meditation, energy work, storing information, protection, grounding, and channeling. They all vibrate to a different frequencies depending on the crystal, its size and use. People are guided to a specific crystal, determined by the matrix of the person at a given time, and that of the crystal chosen. You touch it, and know it is yours - you are attuned to that crystal at that point in time. Crystals can be placed anywhere, held, or worn as jewelry. They know what they have to do. Crystal and Mineral Spheres! We have a wide collection of hand cut and polished Spheres. The sizes vary from 3 1/2" to 6" in diameter. Spheres send out energy all around the room so pick one that you enjoy! Tumbled Stones! Now available, a wide variety of Tumbled Stones! 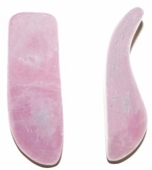 These stones are all polished and smooth and range in size from 1/2" to 2". Check out our current list of Tumbled Stones and be sure to check back. We are adding more daily! Bolo Ties and Belt Buckles! Finally we are getting our stock of Bolo Ties and Belt Buckles up on the website! These ties and buckles are made from a variety of gemstones and most feature just the stone. Some of the belt buckles have engraved holders for the stones. We will be adding more and more of these so if you don't see what you want, be sure to check back! Massage Wands! This is the perfect massage tool! You can work deep without hurting your thumbs but yet you don't have to push so hard because the stone does all the work. They are curved to fit your hand, yet smooth on the clients skin. Everyone needs one!